Hey all. Just wanted to share our recently-launched podcast. We record “Bro, do you even talk pinball?” live on Twitch with interaction from the audience then post the audio to our podcast feed. We just did episode 0, which is our pilot episode where we share our pinball “origin stories,” game room updates and review Stern’s 2011 release, Tron Legacy (just before the Color DMD announcement, naturally). The video version is also available on our YouTube channel if you want to watch. Comments/feedback/thoughts appreciated! Come join us live at http://www.twitch.tv/buffalopinball if you want to be a part of the show, or just listen and enjoy/not enjoy as it may be. The file mysteriously disappeared from Podcast Garden so I deleted the original post and re-uploaded. Should be good to go now! New cast! Tag team broadcast with Taylor Reece (@TaylorVA) from This Flippin’ Podcast from a hotel during the Allentown Pinfest. We talk about the Pinfest show, give Ghostbusters impressions, review The Walking Dead and more. Refresh your feeds or visit http://www.buffalopinball.com/podcast (the YouTube version is still processing so give that some time). Episode 4 is up, now with 99% less echo! 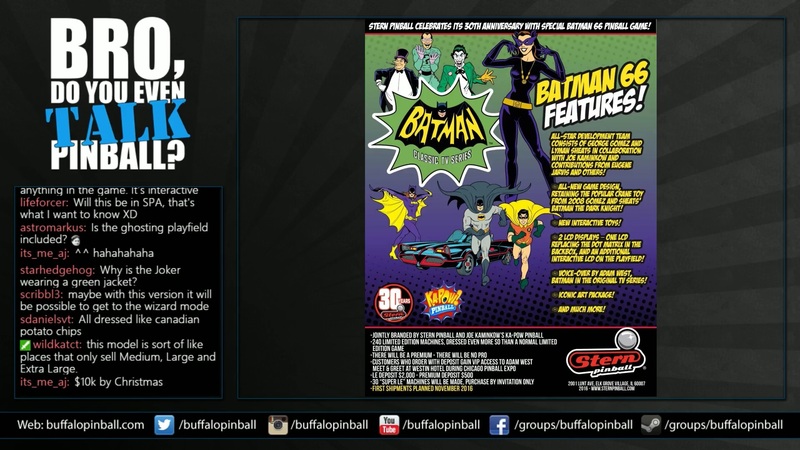 We talk about the upcoming Buffalo Pinball Summer Open PAPA Circuit Event, share tips on buying a new in box pinball machine, review Stern KISS and more! Thanks for the shout-out! Always nice to have visitors from out of town. Thanks for having awesome games in public and having contact info for people to report issues. Did you get Shadow figured out? I want people to come back! I wish I could make it even easier for people to communicate to me and not feel like they’re bothering me with complaints. Yes, I replaced the headers and repinned the connector on J101 and all is well again. Martha joins me and Nick to discuss their pinball vacation to Portland and Seattle. We also talk about the news on Pabst Can Crusher, Domino’s Pinball Adventure and Timeshock and review Stern’s Metallica! Please let Martha know that I ran a tournament at Add-A-Ball on Thursday and saw THREE man buns. None of them were playing since it was the women’s tournament, but I just thought she’d like to know that they regularly show up there. I passed the word along. She was disappointed that she didn’t notice any in person. Oh for a day without a man bun sighting in Seattle. Episode 6 is up, just in time for your road trip to ReplayFX/Pinburgh! Adam Gacek from Domino’s joins the show to talk about the new Domino’s Spectacular Pinball Adventure machine, we recap our trip to Jersey Jack Pinball to stream The Hobbit live from the factory, preview Pinburgh/ReplayFX 2016 and review Stern’s Ghostbusters Pro! Bro, do you even TALK pinball? Ep. 9 - Dialed In! & Hobbit impressions, pinball pricing +more!